Justice Kurtis T. Wilder was named to the Michigan Supreme Court on May 9, 2017, by Governor Rick Snyder. Justice Wilder was appointed to the Michigan Supreme Court by Governor Rick Snyder in May 2017. Before his appointment to the Supreme Court, Justice Wilder was appointed by Governor John Engler to serve as a judge on the Michigan Court of Appeals from December 1998 to May 2017 and a judge of the Washtenaw County Trial Court from March 1992 to December 1998. The 112th Justice of the Michigan Supreme Court, Justice Wilder graduated from the University of Michigan with an A.B. degree in Political Science in 1981, and from the University of Michigan Law School with a Juris Doctor degree in 1984. After graduation from law school, Justice Wilder practiced law with the law firms of Foster, Swift, Collins & Smith, P.C. (Lansing) and Butzel Long, P.C., (Detroit). 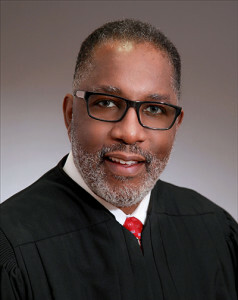 Justice Wilder holds memberships in the Fellows of the Michigan State Bar Foundation; the Association of Black Judges of Michigan; the Federalist Society, Board of Advisors, Lawyers Division-Michigan Chapter; and the Wolverine Bar Association. He has served as a member of the Model Criminal Jury Instruction Committee, the Family Division Joint Rules Committee, and the Family Court Implementation Task Force. He is a Past President of the Michigan Judges Association, and Past Chairman of the State Bar Judicial Conference. Justice Wilder is also the Court’s liaison for issues related to courthouse security. Justice Wilder has been active in many civic and philanthropic endeavors during his career. He is a former chair of the State of Michigan Community Corrections Advisory Board, former board chair of the National Kidney Foundation of Michigan and Nonprofit Enterprise at Work, former board member of The Sphinx Organization, Rotary Club of Ann Arbor, Ann Arbor Symphony, and American Red Cross, Washtenaw County Chapter. Justice Wilder currently serves on the Boards of the Detroit Symphony Orchestra, Children’s Hospital of Michigan Foundation, and Interlochen Center for the Arts. He is an Elder and Chancel Choir member at First Presbyterian Church of Plymouth. Justice Wilder resides in Canton and has two adult children.